This dissertation attempts to investigate some interactional features in the conversation of women and men taking into account verbosity, turn-taking, use of standard forms, directness and assertiveness. 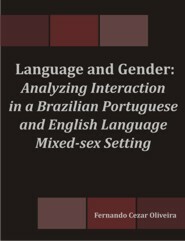 To do so, an ethnographic method of natural conversation video-recording was utilized within a group of 2 female and 2 male Brazilian Portuguese speakers and 2 females and 2 males in a group of English speakers. This study suggests that the amount of talk uttered by women and men when they are in informal occasions may not vary so drastically. Accordingly, this investigation also shows that females and males may interrupt each other's conversation almost equally and may make the same use of colloquial language in informal settings. However, it also shows that women are more likely to make use of hedging devices than men. Hence, the observation of natural talk between women and men seems to suggest that both genders might make similar use of the language with respect to some interactional features of language found in their conversation in informal settings such as the ones described throughout this paper. Fernando Oliveira holds an M.A in applied linguistics from the University of Birmingham, UK and is a Ph.D. candidate at the Federal University of Brasilia, Brazil. His major areas of interest lie in the area of sociolinguistics, discourse analysis and second language acquisition.